Does that photo look like Caramel Popcorn to you? This isn’t an April Fool’s joke - really! According to Chef Grant Achatz that’s exactly what you’re looking at. Achatz, the chef who famously lost the ability to taste (and then got it back), opened Alinea in Chicago’s Lincoln Park neighborhood in 2005. 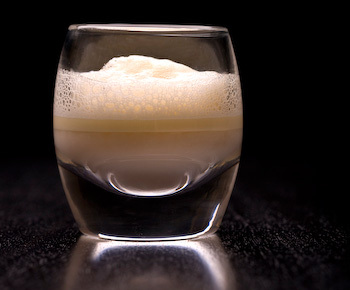 A molecular gastronomist, Achatz is the master of juxtaposing taste, texture and our expectations for both. In a way, Achatz is constantly trying to pull one over on his patrons, so to speak, by creating dishes, pairing ingredients and preparing foods in such a way as to visually and conceptually challenge our notions and preconceptions. Molecular gastronomists focus on the molecular compatibility of foods, allowing chefs to prepare and combine them in unusual ways, to say the least. Imagine your surprise if you ordered a peanut butter and jelly sandwich (not that you would from a 5 star restaurant, but...) and the waiter delivers that (photo above) - bread wrapped around something mysterious, secured with stainless pins and punctuated with a sprig of something vegetal (which turns out to be a bald grape stem). What would you do? "If I present to you something that I call 'root beer float,' but it's not in a glass — it's on a plate — it's not liquid — it's solid — and it's not brown — it's completely clear — and I say 'root beer float,' and you look at it and you look at me and you think I'm crazy, I think that's a good thing, because now you're engaged,” said Achatz in an interview with NPR. “We're engaging you on so many different levels. And then the payoff is when you put that perfectly clear bite-size cube in your mouth, it tastes like a root beer float."